C2E » Expertise » Success Stories » Forklift Fleet Conversion Saves Auto Supplier Flex-N-Gate $1,000,000! Flex-N-Gate Corporation develops, manufactures and supplies parts and assemblies for the world’s leading automakers. Flex-N-Gate relies on fast and accurate material handling to ensure its customers get their orders “just-in-time.”So when they first switched some of their forklifts from liquid propane to battery power, they noticed immediate gains in productivity and efficiency. No more changing propane tanks twice a day, at 15 minutes per tank change per truck. 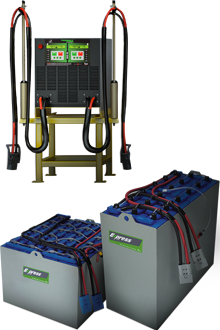 They moved to EnerSys® Express® fast charge battery technology for their lift trucks, and now the batteries charge while the drivers are on break or lunch. As Flex-N-Gate continued to flip their fleet to electric, they noticed something else — thousands of dollars per truck in annual fuel savings. Now with close to 200 lift trucks converted to electric, Flex-N-Gate is realizing more than $1,000,000 a year in fuel savings. Since each plant consumes power differently, Todd works with Flex-NGate to analyze the power needs for each forklift fleet in each of the 30 plants. He then develops a power solution for each truck in each plant. It’s a thorough process, and Todd has enjoyed working closely with the Flex-N-Gate team.